I have some bleak news to share about our Southern Resident killer whales, which normally frequent Puget Sound at this time of year. J-14 seen earlier this year in Puget Sound. 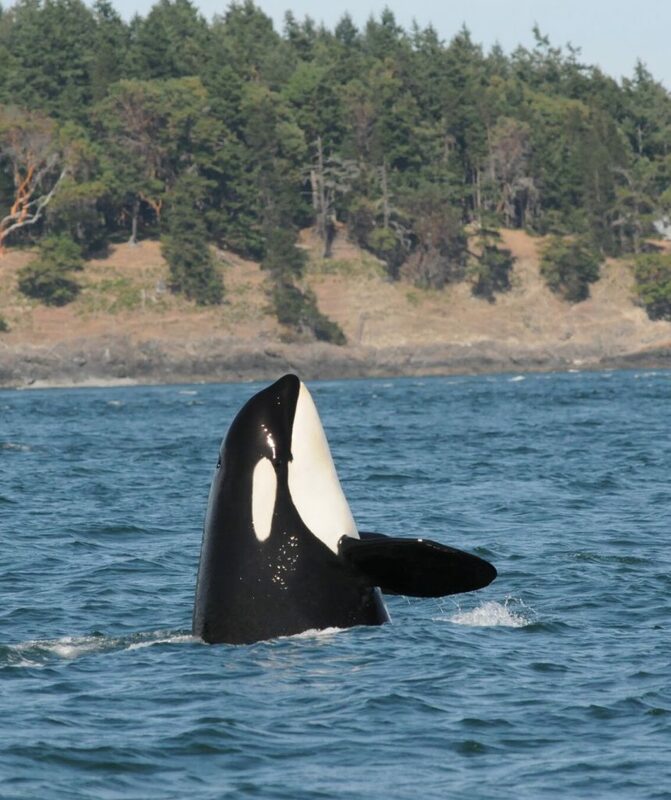 J-14, a 42-year-old female named Samish, has gone missing and is presumed dead, while J-28, a 23-year-old orca mom named Polaris, may be living out her final days. The saddest part of my conversation with Ken this morning was to hear him say that Polaris’ 7-month-old calf would become an orphan and probably will not survive without his mother. That’s the typical outcome for an orphan of that age, Ken said, although there is a chance that the young male will be adopted by his grandmother. The calf, J-54, is still nursing, but he is close to weaning, Ken noted. He is the newest calf born into the three Southern Resident pods and is part of the “baby boom” of nine orcas born between December 2014 and December 2015. So far, only one of those calves, J-55, has died. After my conversation with Ken, the Center for Whale Research posted a news release about the death of Samish. Orca observers on the water have known that she was missing for some time now. As of today, J pod was on its way out through the Strait of Juan de Fuca, no doubt searching for food. The chinook salmon run has been very low this summer. “Historically, at this time of year, we would see nice little bunches (of orcas) swimming back and forth in front of the house,” said Ken, who lives on the west side of San Juan Island. But this year, the whales have broken up into small family groups and are traveling around in seemingly random patterns, presumably in search of whatever salmon they can find. “Even the fishermen aren’t getting much this year,” Ken said. To gauge a killer whale’s condition, researchers consider the overall shape of its body. Without adequate fish — primarily chinook salmon — an orca grows thinner as the body fat declines. As conditions grow worse, a depression develops behind the blow hole. This sunken condition — which Polaris has developed — is called “peanut head.” So far, none of the other animals have been observed in such a dire condition. I’ve often been told by medical experts that when a killer whale loses weight it can be a sign of a major problem, such as a disease that makes them incapable of hunting to their normal ability. But a shortage of food can exacerbate the condition. “We have been telling the government for years that salmon recovery is essential for whale recovery,” Ken said. He blames the salmon decline on longtime mismanagement of wild salmon stocks — including damage to habitat, over-fishing and excess hatchery stocks in both Canada and the U.S. One of the quickest ways to increase the chinook population for these whales is to take out the Snake River dams, he said. Rebuilding salmon runs on the Elwha River will help, Ken said, but the number of fish is small compared to the potential of the Snake River, which flows into the Columbia and produces salmon that can be caught in the ocean. Money spent on law enforcement to make sure whale watchers don’t get too close to the orcas would be better spent on education — specifically on educating lawmakers about the needs of salmon and killer whales, he quipped. As of July 1 — the date of the annual orca census — the population of the three Southern Resident pods stood at 83. That’s the number that will be reported to the federal government. Since then, Samish has gone missing, so the ongoing count falls to 82, pending the status of Polaris and her son. Samish was considered part of the J-2 (“Granny”) family group. Her living offspring are Hy’shqa (J-37), Suttles (J-40) and Se-Yi’-Chn (J-45). Samish was the grandmother to Hy-Shqa’s 4-year-old son T’ilem I’nges. Polaris is the first offspring of Princess Angeline (J-17), who is still living. Her first offspring, a female named Star (J-46), is now 7 years old. J-54 is her second offspring. Agree that whales hanging around polluted shorelines is not a sign of population increase or deep ocean health, but what if we appear to save one species, at least temporarily, but ignite long term food chain collapse? Sea star wasting syndrome timing correlates with the iron conncoction dump just as neatly as the salmon run increase. “”From an ecosystem standpoint, when you perturb the ecosystem, you don’t really know how it’s going to manifest itself in the food chain,” Zabel said. He said there is a potential for the iron to have a negative impact on other levels of food chains in the oceans. George Leonard, chief scientist of the Ocean Conservancy, said he agrees with many of the problems that Zabel has with the experiment. Iron dumping was irresponsible eco-idiocy by arrogant fools. I’d be surprised that the modest amount I am aware was done in a local are would affect populations of sockeye – the one type whose population became surprisingly high, as they go to the deep north Pacific. Chinook on the BC coast tend to stay over the continental shelf. I would expect that anything which increases juvenile survival rate and strength would have a strong effect on adult populations, as would anything that reduces. We’ll have to wait and see if DFO’s dire predictions for sockeye into the Fraser this year come true, so far the fish who go into the Pitt river are proving them wrong. Can a petition be started to take down the Snake River Dams? There is already an initiative that is much stronger than a petition. Call (202) 456-1111 and tell President Obama to remove the 4 lower Snake River dams to help restore salmon and help the Southern Resident Orcas. Each phone call goes directly to a live person, not a recording, and each call represents 1,000 people! https://sites.google.com/site/tilikumandco/home/tdtd tweets and actions to take …. petition https://www.change.org/p/president-obama-stand-with-us-and-support-removing-the-four-lower-snake-river-dams-to-save-the-southern-resident-killer-whales-from-being-dammed-to-extinction#petition-letter pls share info.. I have several pictures of J28 and J54 that I took on Saturday, as well as a few other JPod orcas that I am not sure of. If any researchers need my pictures, I would be happy to send them. There are ways that you can help these whales!! On this website, there are links to petitions you can sign as well information about how to contact lawmakers to urge them to breach the four lower Snake River dams. Please help these whales, don’t let them go out like this!! Salmon is at an all time low. Orcas are starving. Fishing season has been cut short, yet there are fishing nets spread at Gorst and other places. Nets! That’s nuts. Then why don’t we prevent the use of fishing nets spread across streams in Gorst if a shortage of salmon is really the cause? Or is this just another story to support a carbon tax on gasoline? Plenty could be said about over-fishing, netting too close to streams and the need to manage escapement more closely to a stream-by-stream approach. But let’s not confuse these issues with nets at Gorst, which are designed to take out all the hatchery chinook salmon coming up the stream. Chinook are artificially raised in ponds near Otto Jarstad Park. Gorst Creek does not support a natural run of chinook, so sport and tribal fishers are encouraged to catch as many as they can. The rest are removed at the rearing ponds and given away. Some sad news indeed. The share link to facebook is not working btw. THanks. That’s odd about the Facebook link. I just posted it to my timeline and it worked. Is anybody else having trouble? I’m hoping Chris Dunagan will follow up with stories on two major issues mentioned in the article. First, I observe more shoreline habitat being restored in the last 10+ years than being lost due the Shoreline Management Act and millions of dollars of habitat restorations under the multi-billion dollar effort to clean up/restore up Puget Sound by 2020. Publish a list of significant habitat losses so the general public can get their head around what salmon or feeder fish related habitat is now or recently actually being lost. Second, explain the fundamental science of removing the Snake River dams to Southern resident orca population since the Columbia River salmon counts are historically high and have been for the second year in a row if dam fish counts are believable. There are contradictions about population of Chinook/Spring salmon in the Straits at this time. While you claim low, while anglers are catching many near Sooke. Chinook/Spring salmon around VI stay near the Continental Shelf, unlike Sockeye, so are often available to orcas. They will start up rivers soon, depending on how far they are going to spawn. (Sockeye have to start early to get to the upper reaches of the Fraser before freezeup, whereas salmon VI rivers like the Goldstream don’t start until late April.) Orcas also like Chum, another large salmon, that run is larger to the north which helps the “Northern Resident” clans. Orcas do have other sources of food, they go somewhere for a number of months each year. The “resident” pods are Darwin Candidates, culturally limiting themselves by food choice compared to the transient clans who like sea mammals such as seals and their cousins near Norway who’ve figured out how to corral herring to gulp many at once. I challenge the person claiming very low salmon populations in the Pacific to provide complete statistics on salmon populations for the entire west coast of North America, including the Bering Strait and Bering Sea. Salmon populations fluctuate widely, always have. Recall the abundance of sockeye a few years ago. Read history to learn of the shortage of salmon near the Seward Peninsula about a century ago. Solid research shows that salmon populations shift north south with the ocean condition called the Pacific Decadal Oscillation, so when AK populations are lower those off of OR are higher. BC is in between with noticeable fluctuation by specific species. Exaggeration is a major problem. For example, Chinook/Spring populations are relatively low now in a river that transits AK and YT, but alarmists make out as though populations are extremely low when they are not. (Those salmon go to the Bering Sea and back.) Some people spout what they want to be so, not what is true – they typically have a negative view of humans. And simply silly statements, such as one person’s claim that Chinook/Spring are the tastiest salmon. But many say sockeye are, especially those from the Copper River (Seattle fawns over those, calling them by a unique name – beware of varying names used for the same species, naive people can get misled). The attractiveness of Chinook/Spring and Chum to orcas is their size – easy to see or to detect with their sonar, thus easy to catch, using less energy to catch than individual smaller fish thus more net nutrition. (Of course the transient clans hereabouts prefer a much larger chunk of food – seals, but I don’t know how large that population is, they are smart enough in some cases to escape by jumping onto rocks or even the back of boats. I presume the salmon mistook the warm waters near shore (caused by different wind pattern than normal) for warm water from rivers. Fluctuating food sources have always been a problem, for creatures including humans – but humans now have transportation and communication to escape or help. Even a century ago, outsiders helped the tribal people of the Seward Peninsula when both salmon and caribou populations were low at the same time (and whales had been over-harvested – a “tragedy of the commons” phenomenon). Early HBC explorers north of MB paid close attention to where the Inuit were at any time, as they usually knew where food animals had shifted to. OTOH, a tribe like the one who asked HBC station boss John Rae for food would die out without help from smarter clans – he had to point them to a fish population in the nearby lake, and teach them how to catch the fish. They weren’t observant and creative enough to do so. I would like to share a touching tribute to J-14 from Alisa Lemire Brooks, who writes the whale-sighting reports for Orca Network. Alisa wrote the following as the introduction to the latest report after she spent a week on San Juan Island observing the unusual behavior of the orcas this year as they search for food. Summer of 2016 for the Southern Residents has been anything but usual. In our last report of August 18th we got word of incoming residents. The days immediate following I spent a week on San Juan Island in hopes to see the pods traveling, socializing, and foraging in Haro Strait off the west side of the island. I did on many days. Seeing the whales in their habitat is a privilege and a blessing. Seeing the whales struggle to find food is sad and alarming. The entire week I was on island most personal encounters and those of friends and others consisted of unusual combinations of Js, Ks, and Ls spread long distances. Families often foraged and traveled in 1-2’s, some days the entire clan was spread far apart from one another in their search for scarce Chinook salmon. What used to be time for the southern residents to join up for socializing and bonding has decreased dramatically over the years, far more so this summer.